In the end, Mr Sapper ended up with 40,634 Euros and 1,914 backers, well over his modest initial goal of 1,500 Euros. 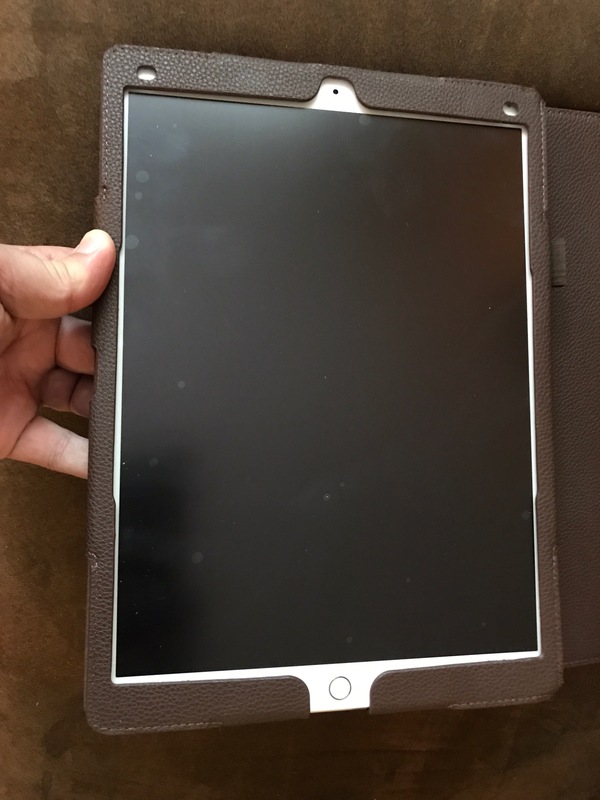 I was one of the almost 2000 backers, picking up a singe protector for my 12.9″ iPad Pro for the Early Bird price of around $20 US Dollars. Not at bad price at all for an iPad screen protector. As soon as the Kickstarter campaign was complete, Mr Sapper started giving regular updates in regards to the production process and when the PaperLike would be shipping. Also, right after the WWDC Keynote and announcement of the 10.5″ iPad Pro, he let us know that he would be supporting the new screen size, and would even allow purchasers of the original 12.9″ and 9.7″ versions to change their orders before ship day if they were switching devices. I was impressed with Mr Sapper’s hands-on and very customer-centric approach here. I’m sure such a change right at the outset of manufacturing wasn’t easy, but this kind of service makes an impression on customers. I got my PaperLike in the mail late last week and just installed it yesterday evening. I will say that, if you don’t have experience installing such screen protectors, you may want to get some assistance. It is a dry-apply protector, which can be more of a challenge than the tempered glass and rigid types that are more popular today. Since it had been a while since I installed one of these protectors, I followed the instructions in one of the videos that Mr Sapper recommended as a “safe” method. That did the trick, and I ended up with minimal bubbles that should work themselves out over the next week or two. My experience has been good so far, but the user posts on the Kickstarter site are more mixed. It seems that the box the protector was shipped in arrived damaged for some users. I was appreciative of the minimal packaging in the video review, as I would rather my money go toward a quality product. However, if the packaging wasn’t enough to stand up to normal shipping wear and tear, then that needs to be addressed. 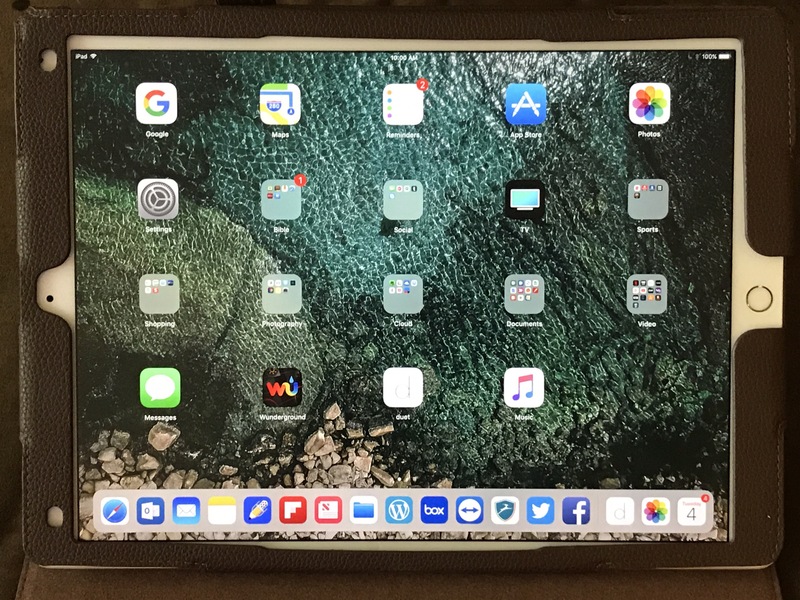 The other two main complaints are regarding the difficulty of installation and a “washing out” or “rainbow reflection” effect of the PaperLike on the iPad Pro’s screen. Installation went fairly smoothly for me, but again, I have years of experience putting various kinds of protectors on, and I know to be very patient and take my time. Still, mistakes can happen, even when you are careful. 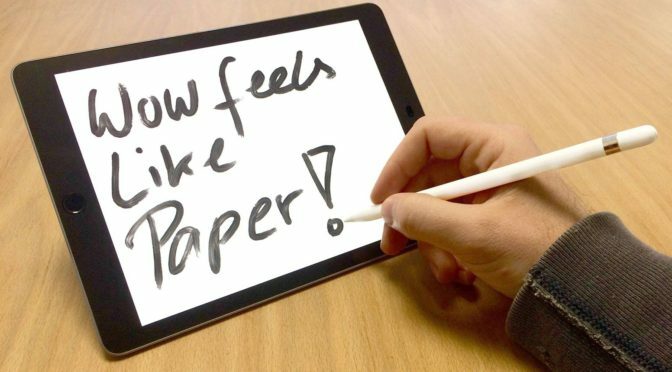 Unfortunately, unlike many tempered glass and rigid screen protectors available today, the PaperLike is not a “multiple-use” product. The adhesive may not hold up if you remove and re-apply it, and it is not washable to remove dust, like say the Clear-Coat hybrid iPhone Screen Protectors are. As for the PaperLike’s effect on the screen, I didn’t take issue with it in the video right after I put it on, and I honestly still don’t. I have used matte-finish screen protectors before and all of them had a far more of a noticeable “washing out” effect on the screen than the PaperLike. However, there are a lot of users in the comments for whom this effect is more than they are willing to tolerate. This is a very subjective thing, so user opinions are apt to vary widely. There were also a some mentions of a “rainbow glare” effect, but I just looked at several web sites and photos with my Pro again to test against this just now, and I do not have this issue. Maybe there are some manufacturing variances that account for this. If so, time should tell. In his response to some of these comments, Mr Sapper has asked users to give the PaperLike a week to see if their opinion changes after a little time to get used to not only how the screen looks with it on. As for the performance with the Apple Pencil, the PaperLike works exactly as I hoped it would. It adds that extra texture and friction that really does make the iPad Pro’s screen feel more like paper when writing. I think it will greatly improve my handwriting on my Pro, and in turn, I will use it even more for note taking. I plan on keeping it on my new Pro for at least the near future to see if my current opinion holds up. So far, I don’t see any reason for concern. Based on the negative comments on the campaign site, it does sound like Mr Sapper needs to fine tune his operation a bit after this first Kickstarter run. The packaging worked out fine for myself and others, but caused some backers legitimate problems. As for the installation, there isn’t much that Mr Sapper can do beyond what he’s already done. The videos are clear enough, but he might be wise to recommend that users who aren’t comfortable or experience installing screen protectors take the PaperLike to a professional, such as a local mobile device repair shop, to have it put on. As for the effect on the look of the screen, Mr Sapper is responding to user comments directly, and it looks like he is going to offer refunds for those who decide that they can’t deal with what they see as a negative impact on the visual experience. He should probably do a little more to warn potential buyers/backers that there is some impact on the way the screen looks after install, and that it is especially noticeable right after you put it on. All in all, I’m still happy with my purchase and will continue to use the PaperLike for the foreseeable future. While I focused on the concerns brought up in the Kickstarter comments in this article, there are also many others who have posted who are also happy with the PaperLike. As I said in the video, I will continue to give updates on my impressions of this protector as I use it more. If you are interested in additional information on the PaperLike, you can take a look at the Kickstarter campaign page here, and Mr Sapper’s Indiegogo page here. You can also get a feel for the install process by watching Mr Sapper’s PaperLike application video here, and his recommended “safe” application video (which I used) here. If you have any questions for me about my experience with the PaperLike so far and how it performs, you can ask here in the Comments section below, on Flipboard, on our Facebook page, or on Twitter @iPadInsightBlog. Previous PostDeals: Mophie Powerstation 8X Battery PackNext PostHappy 4th of July from the Big Easy! Nice! Will have to pick one of these up later when I upgrade to an iPad Pro. thanks a lot for your review and the report about the crowdfunding campaign! I’m glad you’re now enjoying the paper-feel as much as I am.